A foolproof system designed for fast and easy installation of showers and wall partitions. No mason or glass block experience required! The EazyGrout® Panel system was developed to dramatically decrease the time and difficulty involved in building glass block walls. By replacing mortar with rigid spacers and silicone adhesive, the need for masonry skills is virtually eliminated. Using this innovative system, pre assembled glass block panels are simply stacked together with the corresponding vinyl spacer between each panel. Multiple designs of the vinyl stack spacer were formed to fit the various glass blocks used in your custom shower design, allowing for virtually any configuration conceivable. Two beads of silicone are applied between spacer and glass block prior to assembly. Horizontal runs of Vinyl Stack spacers continue the length of the build by the connection of long, straight pieces with the tabs found on all angled spacers. These tabs are designed to push in snug but can adjust laterally to fit small variables in shower curb construction. Specially designed anchors fit into the hollow end of spacers on every other horizontal row, and attach to the adjacent framed wall with screws. Vertical Spacers are pre-cut relative to the height of the panels. These vertical spacers come in a variety of shapes to fit either straight or custom shaped glass blocks. After wall is assembled and has cured over night, grout is applied to the surface joints between all blocks. 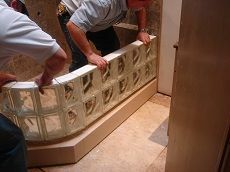 With a rubber float, the joints are filled and sponged smooth to the desired finish. 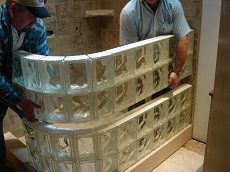 Grout is not applied at the perimeter where glass block meets the framed wall and curb. Caulking is applied in the perimeter joint between glass block and curb or wall for a pliable, watertight seal. This joint is tooled smooth for an appropriate appearance. Your glass block wall is now complete. What was once a difficult and messy task has become simple and foolproof.